Her and I can't be friends. Her and I can’t be friends. Oh, there are so many reasons why! First of all, her can never be the subject of a sentence. That’s reserved for she. Her can only be an object, as in “I’m not friends with her.” Secondly, her and I can’t do things together. They can’t appear in a sentence together like that. Ever. If there’s her, then her friend has to be me. “Mary went to the store with her and me.” Both objects. Only “she and I can be friends.” Subjects together. Happily. I promised here, once before, that I do NOT correct other people’s grammar. 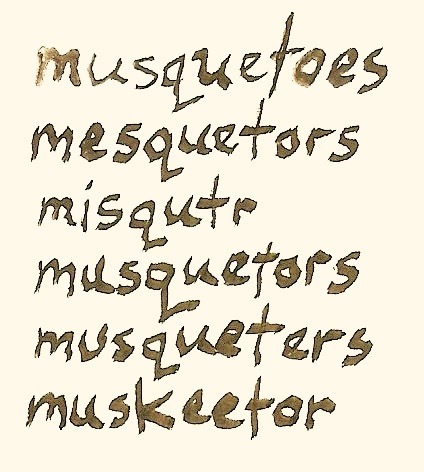 But this is a story about being in my Third Third and suddenly confronting a revolution in the English language. Aiiiieeee! Me and her can’t do that! Am I failing to evolve? Why am I suddenly feeling like the supports of civilization are crumbling? 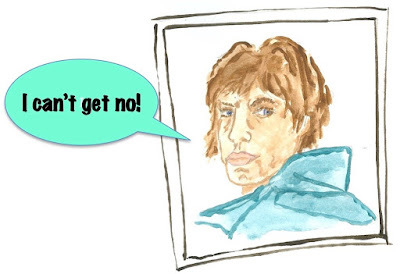 I could handle it when Mick Jagger cried, “I can’t get no satisfaction!” No part of me wanted to counter, “Mick, it should be ‘I can’t get any satisfaction.’” It was a song lyric; it wasn’t spoken English. It’s to dance to, not to talk like. It’s not role-model English. But role-model English appears to be right up there with walking to school and penmanship. Am I showing my Third Third-ism? I have another one: explainer. “Explainer” made its appearance and rapidly multiplied like rabbits. Even on NPR, they introduce “explainers” to clarify something that’s in the news. The explainer is not a person; the explainer is the explanation. See? 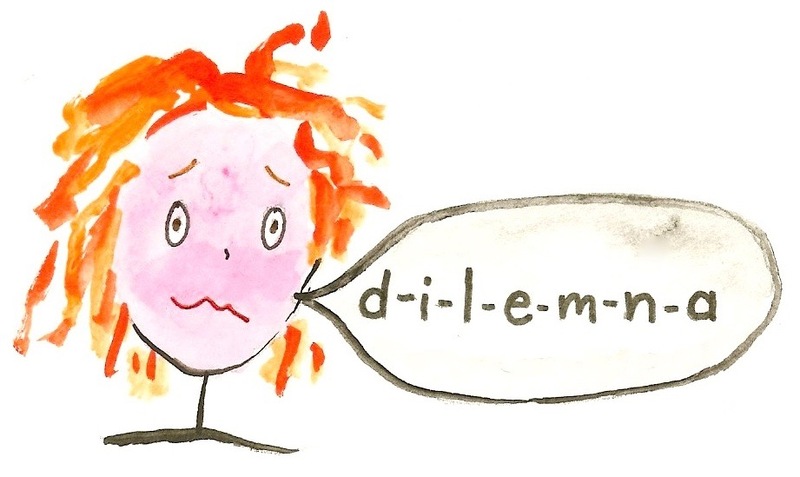 There was a perfectly good word – explanation. If you don’t understand gravitational waves, then you just need an explanation, not some new-fangled explainer. Listen to me! Soon I’m going to be talking about the length of skirts. Speaking of which, didn’t women learn that miniskirts were a restrictive, restraining hassle requiring too much squirming and readjusting – why did they come back again? But I digress…. I know that we don’t say “thee” and “thou” in regular old English anymore. I know that languages change over time. 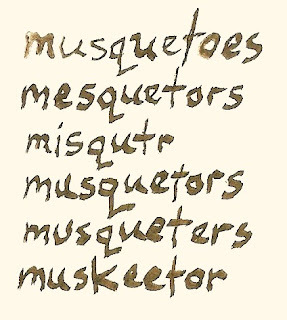 I know Shakespeare invented a ton of words, and Lewis and Clark misspelled mosquito a dozen different ways. I have no problem with changes to their English, but this is my English. 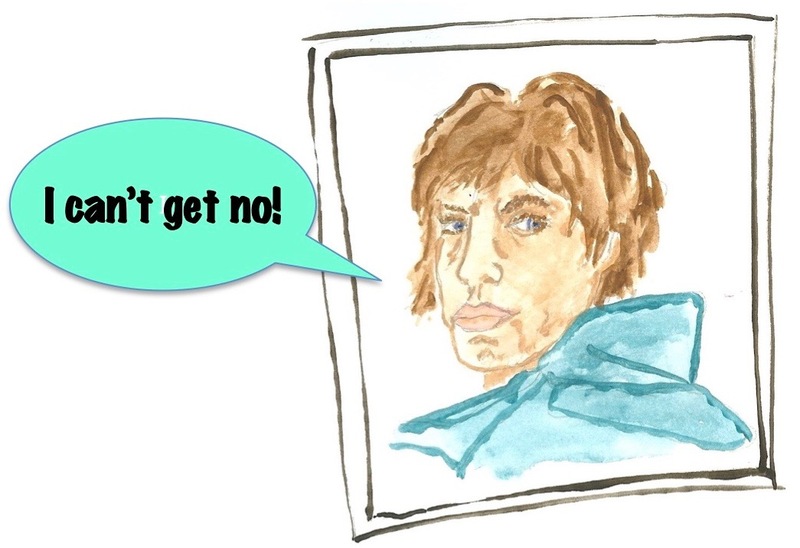 Am I upholding standards … or failing to evolve? Some of my supposedly good English could be wrong. 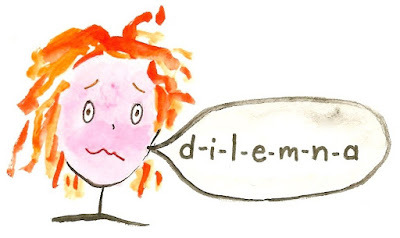 Like how I spent almost my whole lifetime thinking that dilemma was spelled dilemna, with an “n” like condemn. I shudder to think of places I must have used that. I bet I even argued with someone about it. I bet I even taught someone else my version! A few years back, I started noticing the word woken in books, when I thought the only right way to say it was awakened. Who would ever say “You have woken the patient” rather than “You have awakened the patient”? I laughed at that because it’s a joke. Because it’s funny. Me and him might have the same sense of humor. Looking at the world doesn’t take too much consciousness. You look, you see, you move on to some other view. Unless it’s spectacular or very detailed or you have some other reason to inspect it. Maybe you’re looking for a splinter in your toe. I don’t look at my clothes too closely unless I’m looking for a stain. I don’t look at my dishes unless I’m checking if the dishwasher cleaned them okay. I look at the clock, but I don’t examine the clock. I barely notice the clock. 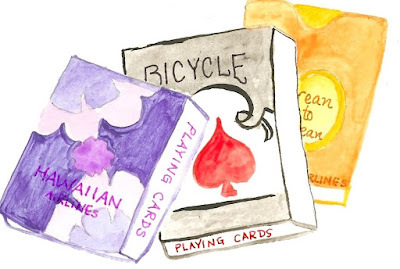 Have you looked at a deck of cards lately? 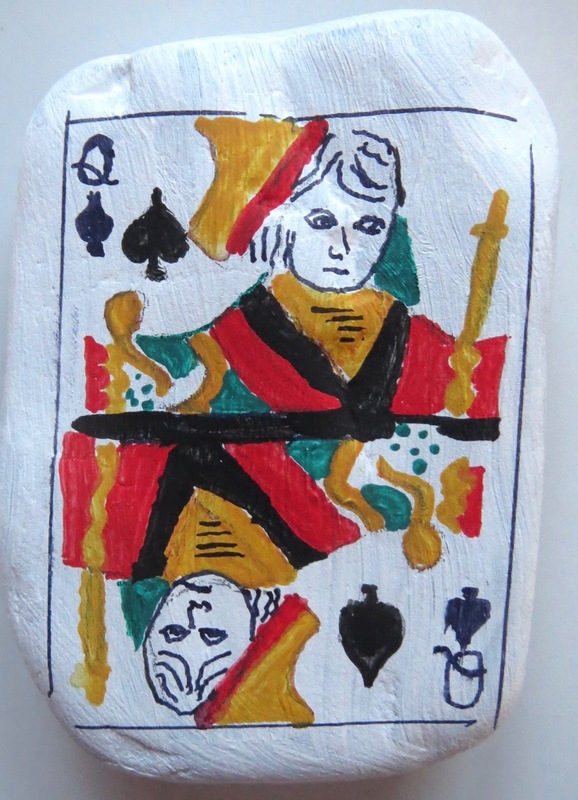 Last month’s challenge for my Bricolage group was “playing cards.” I was going to turn rectangular rocks into playing cards, and I did. But first I had to copy from a playing card. I pulled out the box I keep the decks of cards in. Wow, I had no idea how many I’d thrown in over time! 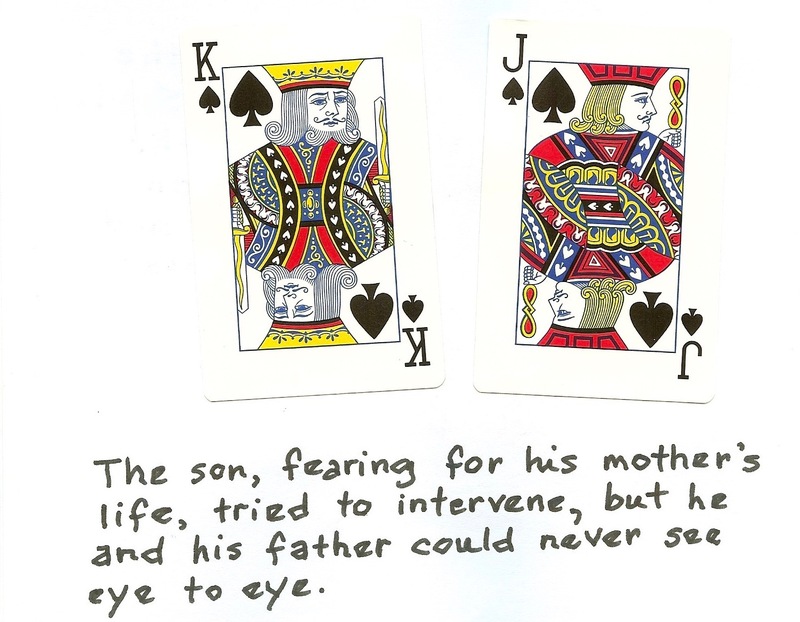 My family used to play Spit, and each person needed their own identifiable deck so the played cards could be counted. Back then, the airlines used to give out decks during flights. I had 21 decks of cards, and that didn’t even count the Go Fish and Old Maid decks! I have Northwest Orient, Delta, Alaska, United, and Hawaiian Airlines decks. I have Carnival Cruise, FedEx, and British Air, too. I even have Peter Dunlap-Shohl’s White House of Cards and Idaho Authors (and no idea where that last came from). Yes, I’m decluttering. Cannibalizing, too. I pulled out the face cards, the Jack, the Queen, and the Kings. This time, in order to paint them, I had to examine them. If you’re a regular old face card, you are bored to tears if not clinically depressed. Your face is SO SAD. Your clothes are bright and colorful, but your eyebrows are sad and there are bags under your eyes. Your eyes are … blank. But I was looking closely, and that’s when I saw that a Jack isn’t a Jack isn’t a Jack. Two of them have mustaches, and two don’t! 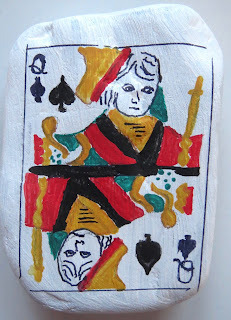 Jack of Hearts is holding a feather, and Jack of Spades is holding some sort of wand (or scepter or rattle). And they’re not looking in the same direction: Jack of Hearts looks hard right, Jack of Spades looks hard left, and the two others sort of lean to the sides. Now for the big discovery: all the queens look to the right except the Queen of Spades. She looks left. Her husband, the King of Spades looks left, too. So they can never look at each other! 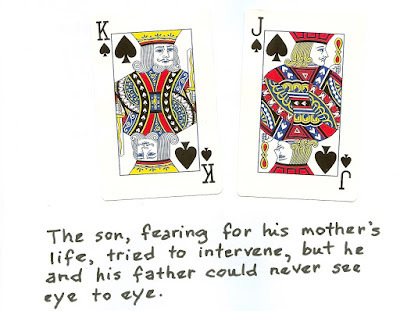 Meanwhile, the King of Diamonds can only look hard right, so he and his queen can never look at each other, either. The only queen’s eyes the King of Diamonds can look into are in the face of the Queen of Spades. Do you see the scandal brewing? The King of Diamonds is the only king extending his hand. Is he reaching for the Queen of Spades??? 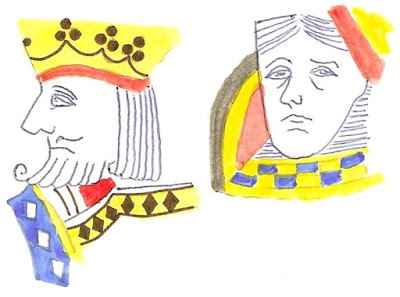 Now, while all the royalty look the same from deck to deck, the jokers are entirely different. 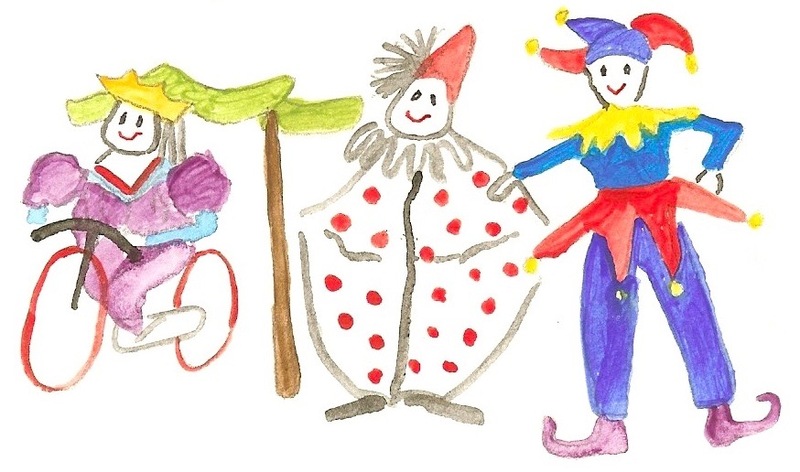 Some are clowns, and some are harlequins. Some are in disguise, some are on bicycles, and one is an Asian juggler. 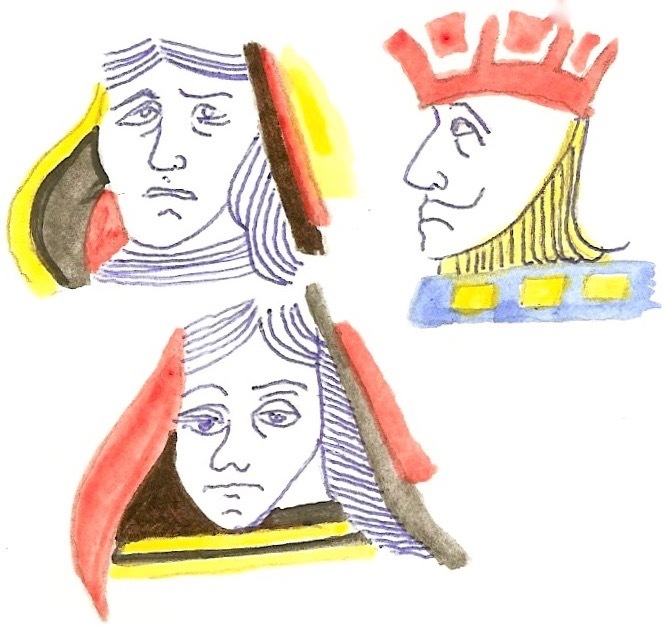 All these jokers, and the royals still look so exceedingly glum. There’s a story there, and I couldn’t resist telling it. I made it into a book. Things just get more interesting when they’re noticed. All sorts of things. Do you know which king is the only one without a mustache?